Objectives: A diet that is high in fat and low in carbohydrates is advocated in the recently published The Real Meal Revolution. A suggestion was made in this publication that seed oils are toxic. 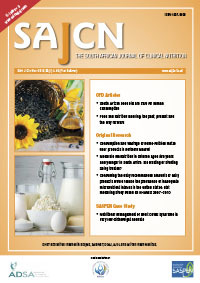 The authors stated that available seed oils on the South African market were high in trans-fatty acid (TFA), as well as being genetically modified, and thus should be avoided. We compared three oils, i.e. canola, sunflower and olive oil, against internationally accepted standards, to determine the quality of these oils using gaschromatographic analysis, to determine whether or not there was any foundation to the statement pertaining to the toxicity of South African seed oils. Reported parameters included the fatty acid profile, TFA content, peroxide level and conjugated diene (CD) content. Design: Samples were purchased from local retail stores. Two independent researchers de-identified the oils, and stored them in numbered containers under nitrogen until commencement of the analysis. Hence, a blind sample of oils was received. Outcome measures: Twelve (n = 12) olive oil, 15 (n = 15) canola oil and 7 (n = 7) sunflower oil samples were subjected to analysis. CD and peroxide levels were conducted spectrophotometrically, and fatty acid content determined by gas liquid chromatography. Results: The total TFA content of the three types of sampled oils was below 0.5%, and the peroxide (meq O2/kg) and CD levels (μmol/g) were within allowable limits, as described in the Codex Standard for Named Vegetable Oils, as well as previous publications. Conclusion: The results demonstrated that the South African seed oils included in this analysis contained a negligible amount of TFA, adhered to international recommendations with respect to fatty acid content, and were well within the safe range for oxidation products. Therefore, the statement that South African seed oils are toxic is inaccurate, unscientific and without merit.